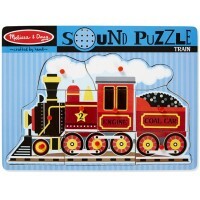 Get on board for a melodious adventure with the Musical Choo Choo Train by Small World Toys! Get on board for a melodious adventure! Musical Choo Choo Train Toddler Playset by Small World Toys combines train pretend play, matching game, animal characters play, and musical fun. 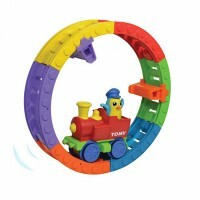 This first train set offered by Educational Toys Planet features bright red tracks to build a railway circle, a colorful chubby train, 3 linking train carts, a conductor figure, and 3 toy farm animals. Kids have to match the barn animals to the correct shaped carriage to see how they rotate in their wagons as they ride happily. The train driver has to be pressed to start the train. 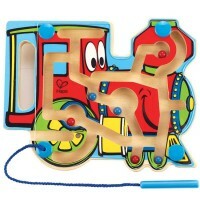 As the train goes along the tracks, kids will love to watch the train engineer light-up and go back and forth. 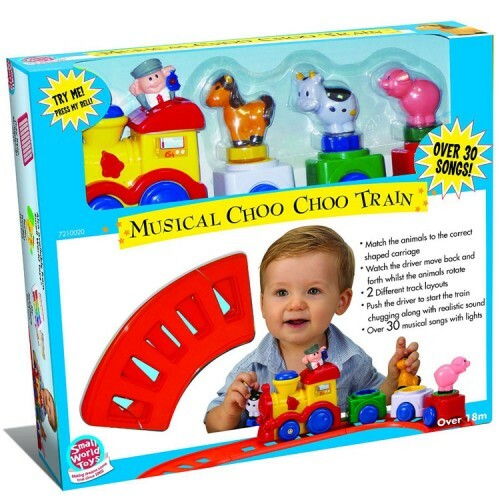 The train from the Musical Choo Choo Train Toddler Playset makes realistic chugging sounds, plays 30+ musical songs, and lights up as it rides. 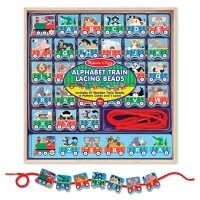 This musical train says a whole lot more than just Chooo Chooo! The electronic toy train requires 2 AA batteries (demo batteries included). 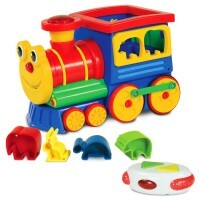 Dimensions of package 12" x 6" x 9"
Write your own review of Musical Choo Choo Train Toddler Playset. Rating: 5 by GLORIA, AZ WOW! THIS MUSICAL TRAIN IS LIKE A COMPOSITION PRACTICE FOR CHILDREN. 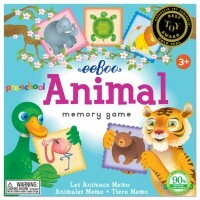 GREAT MUSICAL PRODUCT FOR THE YOUNGSTERS! Rating: 5 by Bella, RI I was amazed by the new idea of this musical toy. I think it makes children be more musically creative, brings their play to the higher imaginative level. I really like this toy. Rating: 3 by Helen, MD I really like this when we first set it up, but in one day's time the train no longer works, I have changed batteries thinking that might be the problem but that did not help. The child love the train and the tune I set up but now upset because it does not work. Rating: 3 by Lisa, VA Runs pretty slow and does not capture my child's attention well.